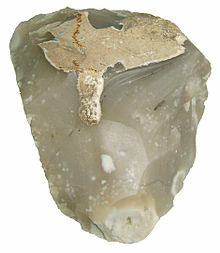 Flint is a haird, sedimentary cryptocrystalline furm o the meeneral quartz, categorized as a variety o chert. It occurs chiefly as nodules and masses in sedimentary rocks, such as chalks an limestanes. Inside the nodule, flint is uisually dark grey, black, green, white, or broun in colour, an eften has a glassy or waxy appearance. A thin layer on the ootside o the nodules is usually different in colour, typically white an rough in textur. Frae a petrological pynt o view, "flint" refers specifically tae the furm o chert which occurs in chalk or marly limestane. Similarly, "common chert" (sometimes referred tae simply as "chert") occurs in limestane. ↑ Flint vs Chert Authentic Artefacts Collectors Assn. This page wis last eeditit on 26 Februar 2018, at 23:49.